I was in the Bobbi Brown store in Covent Garden, it was very busy, I was a bit stressed out, I saw this palette from their christmas collection, picked it up, payed for it and left. It’s exactly how it happened, I promise. When I saw it, I thought it’d be perfect for traveling (I was thinking a glittery version of my UD Naked Basics…) Looking back, I should have swatched it ! I’ll first show you the makeup look I created and then move on to the review. 1. I started by applying shade 1 in the inner corner and under the brow bone to highlight and make blending easier and shade 2 in the outer corner until the middle of the lid. 2. I added shade 5 in the inner corner to highlight a bit more. 3. 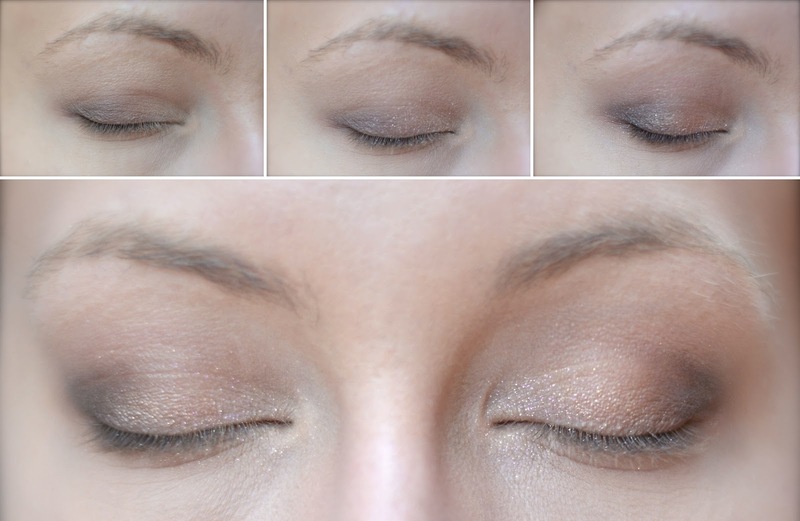 I then applied shade 3 in the outer corner to deepen the look and shade 4 in the middle of the lid to add some sparkle. So I’ll admit, the result looks nice, but it’s not what I was expecting or what I was going for. I’m quite disappointed with the quality of the shadows, particularly in terms of pigmentation. These shadows would be perfect for someone who’s not used to playing with makeup (less pigmentation means that “mistakes” are easier to rectify and less noticeable) or for someone who likes to wear light makeup, but for someone like me who’s looking for intense pigmentation and glitters intense enough to bedazzle a unicorn, this palette won’t cut it. I think that a big part of my disappointment is due to my expectations. Considering the price, I was expecting intensely pigmented shadows and bedazzling glitters. The matt shadows, without being extraordinary, are actually quite nice, it’s more the glittery ones that disappointed me. When trying to pick up the colour, I noticed that they were very hard which made the whole process rather difficult. They also have quite a bit of fallout for a result that is way too subtle in my opinion. That being said, the longevity is good and the matt shadows are very easy to work with and to blend. As for the gloss, the verdict is quite similar: not much colour. It’s a very common gloss I’d say: shiny, a tad sticky, glittery with a menthol scent. Nothing out of the ordinary. All in all : I was expecting to be able to create a very sparkly makeup look with this palette that is very conveniently tiny, but even if the matt shadows are good quality, the glittery ones are just not good enough in terms of payoff (when they should have been the star of the show) and the gloss is pretty average. It’d be good for : anyone who’s looking for very light makeup with just a touch of glitter and a bit of shine on the lips. I’m a bit disappointed that my first encounter with the Bobbi Brown products should be half a failure when I’d been dreaming of trying her products for so long but I’m not giving up ! Have you tried this palette ? What would you recommend from Bobbi Brown ? I'm sorry to hear that, I had the same problem with last years holiday palette. I don't know why but the quality of the eyeshadows isn't as good in their Christmas collections as it usually would be. I love their lipsticks and their lip balm is amazing! The shadow sticks are great too. I hope you're lucky with your next Bobbi Brown purchase.